Kathrin Ohla and Raphael Wallroth explored how this process unfolds in human adults as they detected one of four solutions—salty, sour, bitter, and sweet—and discriminated between salty versus sour and sweet versus bitter. The researchers found strong correspondence between participants’ reaction times and their brains’ electrical activity during these tasks, suggesting that these computations take early in the taste-processing pathway. 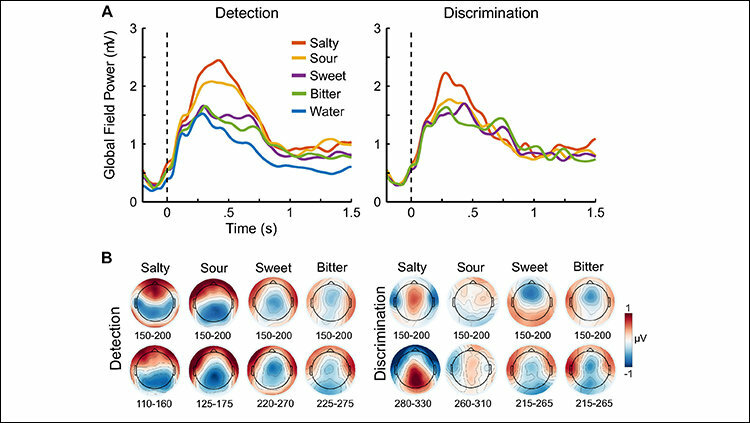 Salty and sour were more quickly detected than they were identified whereas virtually no lag between detection and discrimination was observed for sweet and bitter. As participants rated sweet and bitter tastes as more and less pleasant, respectively, and salty and sour tastes as neutral, this additional information may have facilitated the differences in processing speed.